Chrissy D considers why some reactions to Susie Orbach’s take on slimming clubs are misguided and outlines her own objections to the ethics of them. I’ve written before about aggressive commercial enterprises trying to convince women to distrust their own bodies and buy an outside solution (formerly, by way of baby formula milk marketing) to an arguably non-existent problem. At no time has this issue been more apparent, however, than in watching the backlash against Susie Orbach’s address to a parliamentary inquiry play out in The Guardian and noticing – with more than a slight cringe – that what Orbach accuses slimming clubs of and what Leila Morris claims one did to help her, are precisely the same thing. Both highlight (one perhaps unintentionally so) the fact that, as women, we are living in a commercially constructed diet meritocracy. My concern here is primarily the effect of diet clubs on women, because women comprise the main body of their membership and are the primary target of their marketing campaigns. Just like our media and education system that tells girls they ought to leave the difficult maths and science to the boys or that we really ought to direct ourselves towards a humanities degree, the diet industry reinforces the falsehood to women that numbers are bigger and better than us, more powerful than we are and something to be simultaneously controlled and feared. Slimming club marketing tells women, ‘let me deal with the numbers… I’ll show you how to count. It’s okay, don’t be afraid, I’ve made it nice and simple for you’. Whether manifested as points or calories, they’re all a massive threat that you need to be taught how to control. And they’re hidden in your food. Weight Watchers count points, Slimming Worlders calculate their daily “syns” (what the hell?! ), Atkins enthusiasts add up grams of carbs and many others look to the good old calorie. Morris makes the baffling distinction that “the difference between slimming clubs and diets is that slimming clubs have a structure”. Now, maybe I’m out of the diet loop lately, but I don’t know many diets where there isn’t some sort of structure, be it weighing, counting, or some other framework holding it together (literally captivating the participant), however liberal it is dressed up to seem. Furthermore, on a weekly basis, at the slimming clubs condemned by Orbach and celebrated by Morris, women are told not to listen to their own bodies but to take orders from an all-knowing source: the slimming coach. In Morris’ case the higher power came in the form of a “terrifying leader”, who had her flock so paralysed with fear that they, presumably, stopped eating and started counting in terror. My favourite apparent vindication of Weight Watchers, however, comes in the form of this statement: “(the leader) didn’t like you to lose much more than a pound or two a week – anything else was too quick and unrealistic”. Uh-huh; that’s because the Weight Watchers autocrats need lifers, not defectors who are going to realise their own oppressive condition and drop out. My next objection to the ethics of diet clubs is their fake generosity in introducing you to the (only) answer to your hopeless overweightness. “I liked that nothing was forbidden”, because if something was forbidden, you’d think “to hell with this” and not pay for another week, right? Just count it up in your “How ‘synful’ have I been today?” total, then base your self worth on your ability to know the evilness-level of a Walnut Whip. Jennifer Hudson, the recent posterchild for Weight Watchers in the US, was allegedly paid lots of money to endorse their weight loss program. Now, as generous as those massively profiteering multi-national weight-loss companies claim to be, if it were truly about making you healthier, and not them richer, wouldn’t they be giving this away for free? Not paying someone extremely successful to sell it? Orbach has her finger on the pulse of the industry, describing such organisations as “snake-oil sellers”. Finally, as if any more needs to be said, Morris’ summary that Orbach is “over-thinking the whole thing” seems almost ironic. Well, at the risk of being predictable, somebody’s gotta get doing some thinking about this. Precisely what slimming clubs do is take a simple concept, over complicate it, and sell it back to whoever will buy it. When in Fat is a Feminist Issue, Orbach told women to – above all – listen to their bodies, not diet gurus, not calories, not even her, it was 1978. Now, 34 years later (that took this Humanities graduate eight seconds to count out), have we moved forward at all? Or are women, not passive nor stupid, still victimised psychologically and physically by the diet industry? I’m not denying we as a society are having a body crisis, but slimming clubs are part of the problem, not the solution. 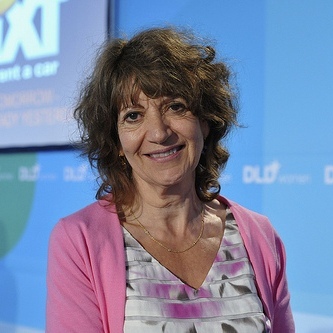 Picture of Susie Orbach at the Digital Life Design women conference in Munich (in front of a light blue background) by Hubert Burda Media, shared under a creative commons licence. When you talk about Orbach, you have to mention ‘Bodies’ as well. It really, really explained everything to me about this whole industry and why it’s so very, very wrong. Superb stuff. Absolutely agree re: Bodies; a fabulous and explanatory read – I felt it was too much to touch on it here! Why not? By propagating this myth, you contribute to the fatphobic environment which drives women to these clubs in the first place. It seems oddly out-of-place in an otherwise excellent article. @Sebastienne. Obviously Chrissy will be better placed to reply here but my interpretation was that “body crisis” was a reference to the pressure that we’re under to look a certain way and the effect that has on us as a society (i.e. that it’s understandable that a lot of people are compelled to want to fit with the ideal and end up joining slimming clubs). Still, fatphobia is very much alive and kicking throughout the media and, unfortunately, seems to often be taken as so-called “common sense” so thanks for flagging the phrase up. Holly sums up what I meant with that part – “body crisis” is a reference to the pressure people feel or are put under to look a certain way and the effect it has on individuals and society. @Holly, @Chrissy – thanks for the clarification, & sorry for jumping to conclusions! “Body crisis” was close enough to the very loaded “obesity crisis” that I just assumed they were the same. No probs – I was going to say ‘body image crisis’ but I thought that was a bit misleading too, perhaps in another direction! I don’t normally comment on articles here as I tend to agree with them, but I totally disagree with the things said about Slimming World. It is not about calculating syns or calories, but about healthy eating and that I can eat chocolate, takeaways etc, but in moderation. After I started using a wheelchair, I gained weight and my confidence was shot to pieces, I could barely leave the house on my own. Joining Slimming World got me out of the house, helped me get back on healthy eating, and more importantly make new friends. As a result, my weight my still wavers when I indulge, but my confidence is more than it has ever been, and gave me the courage to go out and try new things. So, it isn’t just about “dieting”. I am pleased that Slimming World gave you confidence and helped you lose weight when you wanted to. I don’t disagree with your experience. I do maintain that slimming clubs are designed for, above all, profiting from the commercially created body crisis society is going through, and that they are a strait jacket for most members. I would also put it to you that you helped yourself get confidence back and lose weight when you wanted to. Since my post summarised my view, I will leave it at that for now.